This pack is the full game, has no/cd crack so it a complete standalone so if your disk is messed up your all set with this mod. 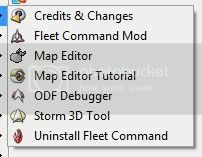 Need a armada 2 modder to convert space package over to armada 2. Awesome!! when will it be available for download? Sorry to Necropost but I was wondering if Fleet Command still exists? I had a version of this, probably not the latest. This was back when I contributed some physics files and map objects to the mod. As far as I know, the mod was never completed. AFC reworked the first mission, and that's where it stopped. I'll look around in the archives to see if I still have it. Most of the units, map objects and weapons were done. Would be nice to revive this, or at least release the assets so that someone can re-purpose them elsewhere. Could some of the stuff from Fleet Command be worked into Future Tense?